BONN, Germany, May 11, 2018 (ENS) – It was a record-hot April in Germany, where governments Thursday concluded two weeks of talks aimed at preparing the Paris Agreement’s operational guidelines for adoption at the annual United Nations climate conference set for Katowice, Poland in December. The guidelines are essential for determining whether total world emissions are declining fast enough to achieve the goals of the Paris Agreement, which include limiting the global temperature increase to well below two degrees Celsius, while pursuing efforts to limit the increase to 1.5 degrees Celsius. 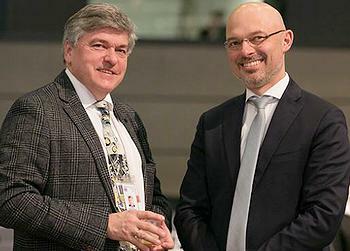 “I am satisfied that some progress was made here in Bonn. But many voices are underlining the urgency of advancing more rapidly on finalizing the operational guidelines. The package being negotiated is highly technical and complex. 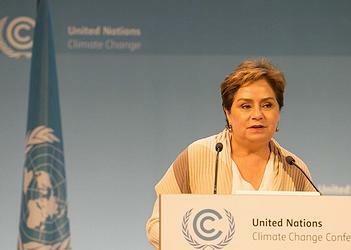 We need to put it in place so that the world can monitor progress on climate action,” said Patricia Espinosa, executive secretary of UN Climate Change, formally the UN Framework Convention on Climate Change, UNFCCC. 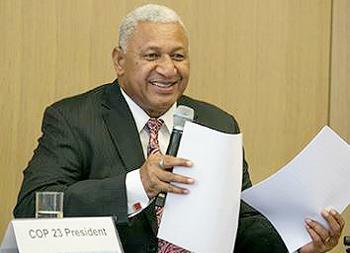 In parallel to the formal negotiations, the Bonn meeting hosted the long-awaited, Fiji-led Talanoa Dialogue. Fiji hosted the 2017 UN climate conference, known as COP23. Following Pacific tradition, Talanoa Dialogue participants share stories to find solutions for the common good. In Bonn, some 250 people shared their stories, providing fresh ideas and renewed determination to strengthen climate-calming ambitions. “Now is the time for action. Now is the time to commit to making the decisions the world must make. We must complete the implementation guidelines of the Paris Agreement on time. And we must ensure that the Talanoa Dialogue leads to more ambition in our climate action plans,” said Frank Bainimarama, Prime Minister of Fiji and President of COP23. The Green Climate Fund Update gathered over 80 participants in a session introduced by GCF Co-Chairs Paul Oquist and Lennart Båge. The Green Climate Fund is a new global fund set up in 2010 by the 194 countries who are parties to the UNFCCC, as part of the Convention’s financial mechanism. GCF has gathered pledges worth US$10.3 billion, mainly from rich countries, but also from some developing countries, regions, and one city, Paris. In Bonn, the co-chairs highlighted GCF’s recent progress into maturity, including the approval of 23 projects worth over US$1 billion in GCF resources at its most recent Board meeting, and suggested that the trigger for GCF replenishment would likely be reached this year. The GCF intention is to use public investment to stimulate private finance, unlocking the power of climate-friendly investment for low emission, climate resilient development. But nongovernmental observers in Bonn slammed rich countries for withholding financial commitments to support developing countries in their struggle against the warming climate that is already overwhelming. They accused wealthy countries of blocking progress on key issues like finance, making it difficult for other areas of the negotiations to progress. “But with developed countries refusing to move on finance, lots of pieces are still unfinished. This is holding up the whole package, which is supposed to be finalized at the end of this year. Issues are piling up, and it’s a dangerous strategy to leave everything to the last minute,” Singh warned. Civil society groups expressed dissatisfaction with the Talanoa Dialogue, which adopted a storytelling approach and discouraged singling out any one country or group of countries for inadequate climate action plans. With countries slow to reduce their emissions, more attention is turning to the area of “loss and damage,” which refers to the impacts of today’s climate change. An expert dialogue was held in Bonn and saw many vulnerable nations and campaign groups make the case for greater attention to finance to deal with these impacts. “There has been a strong call for the badly needed finance for loss and damage this session, but little movement to deliver it,” said Rachel Kennerley of Friends of the Earth England, Wales, and Northern Ireland. “The longer it takes to provide dedicated financial support for loss and damage, and the slower emissions cuts, the greater impacts of climate change will be and the bigger the bill in the end,” Kennerley said. “And while Global North obstructionism mired these talks in delays, obstruction and censorship, Global South leaders prevailed in securing a clear path forward for the conflict of interest movement, ensuring the issue will be front and center next year,” said Bragg. Talks resume in Bangkok, Thailand September 3-8 where negotiators will pick up “informal notes” forwarded by this session. They will attempt to turn these notes and various inputs from countries into the basis for a negotiating text ahead of COP24 in Katowice, Poland December 3-14. UN Secretary-General António Guterres has announced that he will hold a Climate Summit at UN Headquarters in New York in September 2019 to review the Paris Agreement commitments.